For reasons that escape me, that might just justify seeking professional help, I bought another cookbook. Worse yet, it was another bread book. Considering that my present situation is far from optimal for bread baking, I wonder if even the best therapists are good enough to help me. However, in my defense, Carol Field’s “The Italian Baker” is wonderful! 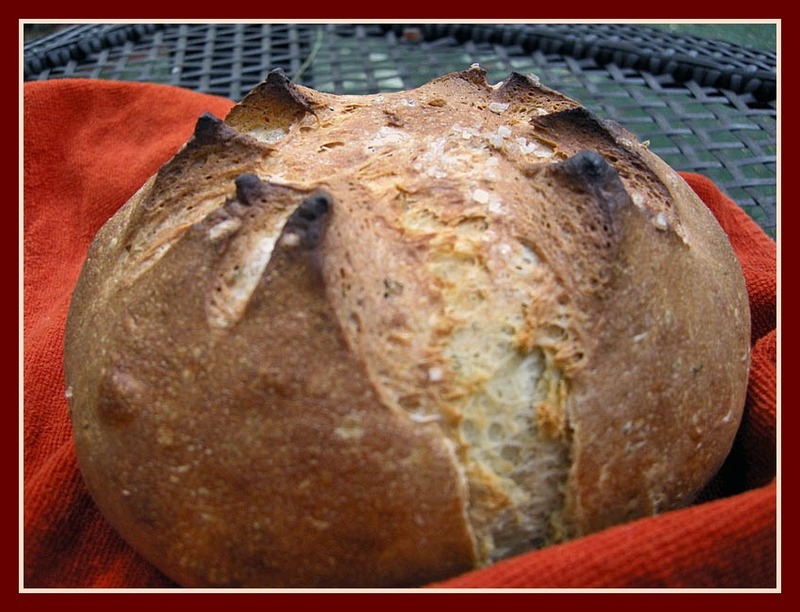 It covers breads from all over the country, always with some background information on their origins and detailed instructions on their preparation, using manual kneading, a mixer, or the food processor. The book doesn’t have photos, just simple drawings. In another cookbook this approach might bother me, but in this case I don’t mind being without pictures, because the richness of the text compensates for their absence. Carol’s descriptions make me want to bake every recipe in her book – which includes almost 100 breads! Mix the warm water with the yeast in a large bowl, wait for a few minutes until it gets bubbly. Stir the milk and oil with the paddle blade. Add the rosemary leaves, flour, and salt to the bowl. Mix gently until the flour is moistened, change to the dough hook and knead on low speed for 5 minutes. Remove the dough and knead by hand for a couple of minutes. Place the dough inside an oiled bowl, cover, and let it rise at room temperature until doubled, about 1.5 hours. Carefully remove from the bowl, shape into a ball, and let it rise for 45 to 55 minutes, but don’t allow it to double in size. As you wait for the final rise, heat the oven to 450F. Slash the bread with a razor blade forming an asterisk on top, then sprinkle coarse salt inside the cuts. Bake 10 minutes with steam, reduce the oven temperature to 400F and bake for 35 minutes more. Remove the bread to a rack to cool, and don’t cut it for at least one hour. Comments: Carol says this is one of her favorite breads because its simple preparation allows her to have it at the table almost at the spur of the moment. Although you could make it with dry rosemary, I urge you to use fresh, and go for the maximum amount recommended. The flavor is not at all overpowering, and the pleasant hint of rosemary makes this bread a good match for many types of sandwiches. We enjoyed it in sandwiches of thinly sliced flank steak, grilled medium rare, and didn’t even add any cheese. But of course, a little burrata on top and a quick run under the broiler will satisfy your most hedonistic inclinations. The detail of sprinkling coarse salt in the slashes is pure genius! 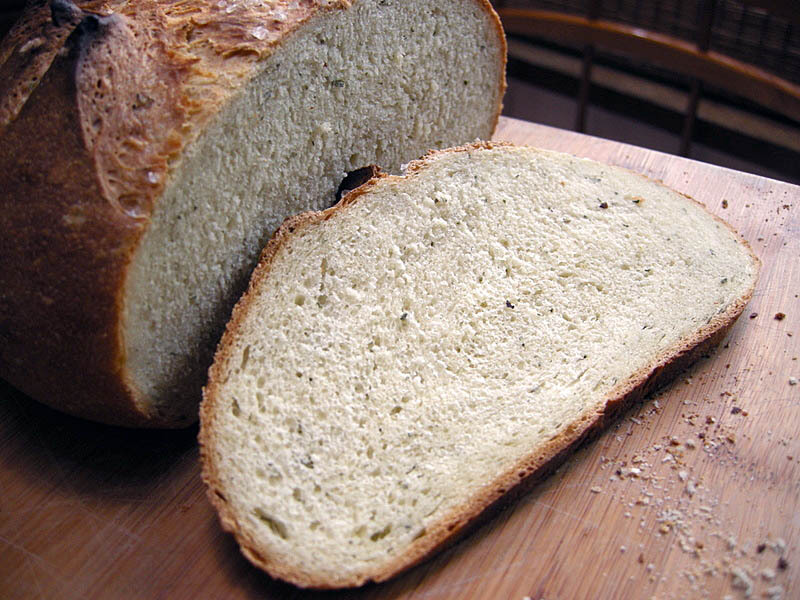 Every once in a while you get this extra punch of flavor, as the salt enhances the herbal tone of the bread. Perfect. Nice work here, the panmarino. I haven’t come across it in the bakeries but will look out for it in future. Just had chicken doner kebab with bbq sauce for lunch to day and it was wonderful. Only cost about $8.50. Love the crushed strawberry and yoghurt drink as well. No worries about leftovers – everyday is a fresh day, loooking for new wonders. What is not nice is left behind and forgotten. I did that to my pizza the other day, left behind half of it. Elra, I think her pesto bread will be the next one I’ll attempt from this book… Sounds delish! It is a clear addiction, but a relatively harmless one. Looks delicious. I imagined you would do that, Jean – plus, with a NEW bread machine! Beautiful crust on that bread Sally. No other way but keep exercising all the bread out of the system! Hope you try it, Celia…. If you find that therapist who can help with cookbook buying issues, let me know! Sounds like a great addition to you collection. The rosemary must be delicious in this, and now I want to try sprinkling salt in the slashes of the next loaf I bake. I am afraid we are beyond help, as cookbooks keep being published… Now I’m tempted by “Around my French Table” – haven’t browsed the reviews a amazon.com, but at some point I won’t be able to resist a glance. Then, it’s all downhill…..